NOTE: Jeph Duarte is out from August 9-14. I’m covering the Open Topic with a 5 part story about NBA Las Vegas Summer League. This is the third part, the fourth part will be published tomorrow. Read Part 1 here, Part 2 here, Part 3 here. After breakfast in the writer’s room, I headed up to the arena to catch the Spurs vs. the Wizards. Mike Cruz, a Pounding the Rock reader contacted me via Twitter, and we arranged to meet up at the game. I’m always shocked when I find out that someone actually reads my articles, and I’m doubly surprised when they tell me that they enjoyed reading them, so I was really looking forward to meeting up with one of my readers. I didn’t have a press pass, so I was sitting in the regular seats, but it was still a great vantage point to see the game, half court about 20 rows from the action. I was wearing my #2 jersey, which probably was a mixed signal to other fans of the Silver and Black, but was definitely a conversation starter. 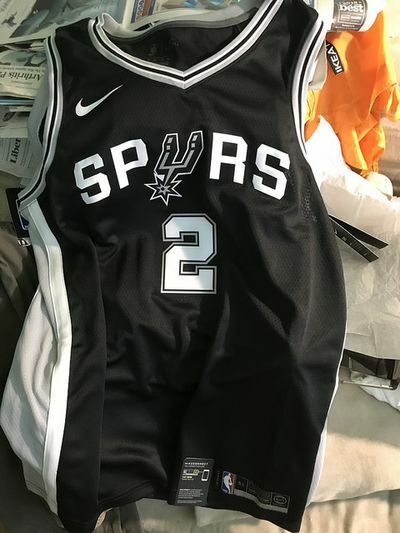 Several fans walked up to me and asked me what was going on with Kawhi Leonard, since I was the guy wearing the jersey. After all, I’m wearing his jersey, I should know what he’s thinking, right? I tried to turn it back on the person asking the question, but apparently, Kawhi is just as much an enigma to fans of other teams as it it to fans of the Silver and Black. The Spurs looked much better than they did in their previous outing. Jaron Blossomgame had a breakout performance, really playing hard and with a lot of poise. Head Coach Will Hardy proved he was a Pop disciple with an early timeout in first quarter after a missed assignment. Derrick White looked very good early as the Spurs streaked to 18 pt lead, but began to limp noticeably in the second quarter, which caused Coach Hardy to pull him from the lineup. As it turns out, Derrick had a strained hammie and his Summer League was done. With White out, Jeff Ledbetter took over the point guard duties, and the Wizards chipped away at the lead, but Lonnie Walker IV and Blossomgame did just enough to them off. Walker’s steal and coast to coast slam dunk in the second half reminded me of another player who used to be on the Spurs. Lonnie has a really good game but Jaron Blossomgame made the key play at the end that kept the Wizards from tying the score. Chimezie Metu has potential, he has a good offensive game but his defense still needs work. He bites on every pump fake, and isn’t strong enough against conventional bigs to hold position. I know it’s just Summer League, but the fans still care. As the final buzzer sounded, one Wizard fan near me yelled “It hurts so much when they lose!” as he shook his head sadly. The Spurs won 95-90 when Blossomgame iced the game with a pair of free throws. 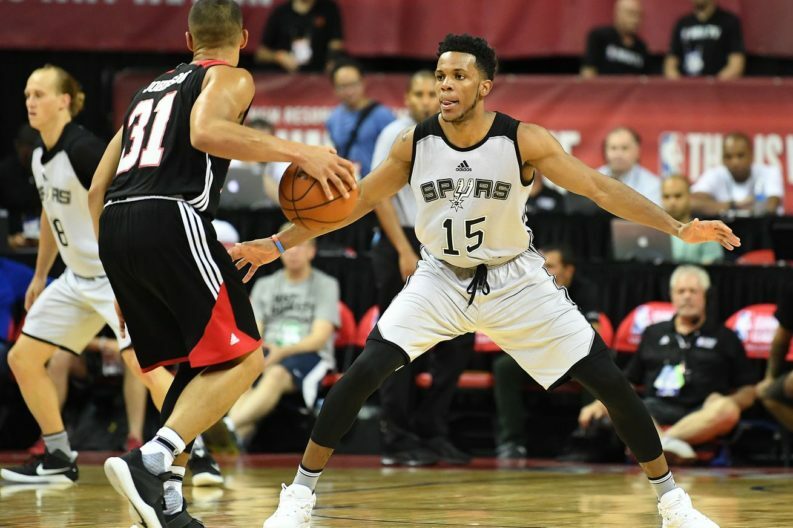 As it turns out, that would be the only win for the Spurs in this year’s Vegas Summer League, but they had accomplished what they needed to. Derrick White has shown that he’s ready to contribute and Lonnie Walker IV demonstrated potential. Blossomgame made a strong case for the Spurs to keep developing him, and Metu showed he had the tools to eventually become a player, but needs development to be a better defender. This was my third day of intensive NBA summer league games, so I was getting a little burned out on watching game after game of bad basketball, but Mike, the fan who watched the game with me, told me about another event that might be worth checking out. Travis Pastrana was going to jump his motorcycle in a series of three jumps that replicated some Evel Kneivel’s most famous jumps, all in just a few hours. The first jump site was just a few blocks from the stadium, so I headed over to check it out. The jumps were to take place in the middle of the day in a gigantic parking lot which had been set up with a viewing area and two spectacular jumps. One with a pile of junked cars and another with 21 full size tour buses, which was a couple more than Evel went over. It was an interesting experience, standing on the hot pavement for about 2 hours in insanely hot conditions. The people watching was the best part of the experience, the crowd were a motley collection of odd people straight from the pages of Fear and Loathing, but I wasn’t able to spot Hunter S. Thompson, although he very well could have been there. I arrived just in time for the first jump, but didn’t have a good enough vantage point to get any good photos, but for the second jump, over 21 buses, I was able to shoot a short movie. It was a long wait, but the jump itself was flawless, and the sun-baked crowd was able to muster a cheer for Travis as he landed in a fusillade of flares. He had still one more jump to do, over the fountain in Caesar’s Palace, but I resolved to watch that one on television, as my water ran out and I was about to suffer heat stroke.